This slide show is pretty comprehensive in outlining the nature of the “money problem” and in describing what is needed to solve it. It highlights some little-know history about the evolution of banking and the politicization of money, along with the principles that can be applied to liberate the exchange process and lead to a more just and sustainable economic order. It is based on a presentation made by Thomas Greco in Tucson, Arizona on March 13, 2007. Go to our main website download and view it. This entry was posted in Basic Concepts, Exchange Design, The Political Money System. Bookmark the permalink. 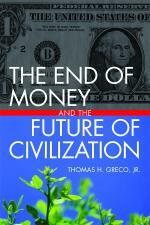 I came across your book when searching for answers to what is money. I did this because we have been working on an alternative approach to help solve our current water crisis in Canberra Australia. We came up with the idea of rewarding people not to consume water, charging them more if they consume more than others, and requiring rewards to be spent on ways to save water or to increase the supply. We just may have persuaded our local government to let us introduce the scheme. Another way – which is the one I am now trying to describe is that we have created a currency that has changed the goal of “wealth creation” to the goal of “wealth creation as expressed by water”. I am working on another system called Energy Rewards which we are about to try to sell to corporations that want to “do the right thing with respect to climate change”. Energy Rewards has the goal of increasing wealth through saving using greenhouse producing energy and through increasing wealth through the production of emission free energy. All this fits in well with your ideas on new currencies. I think we may have discovered a way to compartmentalise economies in a relatively simple way so that our wealth creating machine can be used to target particular problems and not let the wealth be diverted to wars etc.